We’ve all been there: you rock up to a quality restaurant with your mates, having a good chat, peckish for a bite, and then it happens. You have an 'Indecisive' amongst you. Peckish turns to hungry which turns to starving as you patiently sip on your fifth complimentary glass of tap water, wishing they would just make their bloody mind up and order. But it doesn’t have to be this way! There is hope, and it comes in the form of Brisbane's best banquet feasts. The agony of choice is banished and plentitude reigns supreme as the whole table is treated to a repast of the finest dishes in the house that'll impress even the pickiest eaters—no decisiveness required. Here are our picks of the best banquets in Brisbane that will cool dinner debates and free you up for more compelling banter. Serving up classic Southeast Asian cuisine with a splash of personality is List fave Longtime. Inspired by the communal eating style of Southeast Asia, the team at Longtime have added some elegance while keeping an informal vibe, ensuring you're comfortable as you eat like a king. Longtime has three banquets to choose from at $50, $65, or $80 per head depending on which you pocket. All are chock full with mouth-watering creations including banana flower with grilled chicken, papaya salads, bao, curries and noodles galore. Make sure you book a table, Longtime is a Brissy staple that is known for bringing crowds. Take your tastebuds on a trip from the rustic Spanish countryside all the way into the heart of Barcelona at this Paddington gem Peasant. Chose from three banquets, all with over eight dishes, to share with your pack of firmest amigos. First is ‘El Festin’ banquet featuring pork belly chicarrones and lamb empanadas at $55 a pop. Up next is ‘La Corrida’ offering rustic Spanish meatballs and croquetas de tapenade at $65 a person. The finale of this trifecta is ‘El Torazo’, dishing up seafood zarzuela and seared scallops. We are not sure what all those words mean, but they sound delicious and we're game. Each banquet ends with traditional Spanish desserts and you can even level up your banquet with a drinks package. Churros and sangria for all! 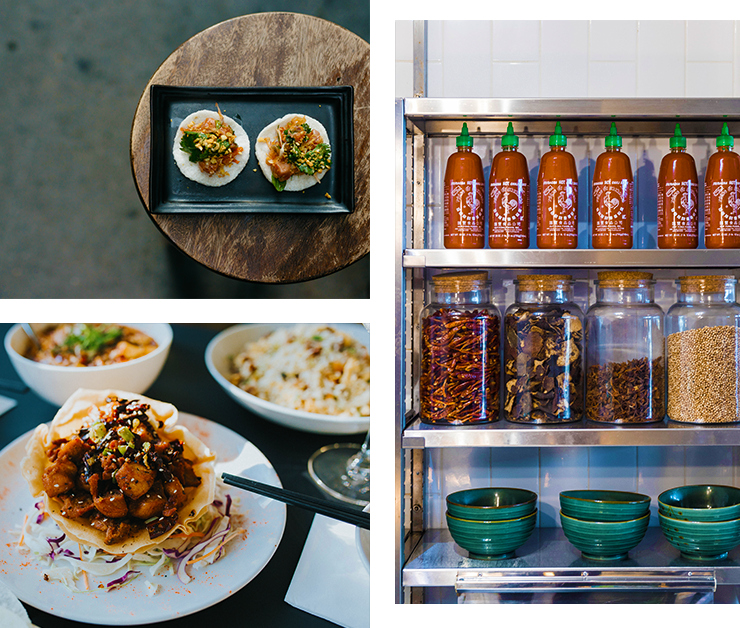 Serving up modern Asian cuisine that doesn’t disappoint, Madame Wu is a Brisbane icon. They also serve up a legendary lunch banquet and an even more luxurious dinner feast for you and the squadron. For lunch, expect wagyu dumplings, steamed duck buns, braised beef cheeks, and roasted pork belly, all served with wok greens and fried rice, and for dinner, indulge in scallop dumplings, wok fried Moreton Bay bugs, jellyfish salad, wagyu brisket, roasted duck, and so much more. As if that hasn’t already got us drooling, there are matching wines. We can’t even. Happy Boy's super swift Chinese feastings have long charmed and sated us. Their dishes are a constant delight and the warehouse grunge of their Spring Hill digs creates a clamour reminiscent of a Chinese market. But I digress, we're here for the banquet, and what a bloomin' marvellous banquet it is. Rather than pen themselves into the restrictions of a set menu, Happy Boy lets the table take the lead. Just tell your server what you like and what you don't and the kitchen will send up a customised shareable feast that has never failed to stuff even the largest appetite. Chop Chop Chang’s is all about bringing people together through a shared love of food. With extensive gluten free, vegan, dairy free, and vego options nobody misses out at this pan-Asian, street food-inspired restaurant. In the spirit of sharing they have four top-notch banquet menus. Ringing in cheapest at $38pp is their Hawkers banquet, serving up the classics with dumplings, corn cakes, and curry. Their most lavish feed weighs in at $68pp and let me tell you it is worth the extra dosh! The Royal Thai Banquet will set you adrift in scallops, skewers, and sticky beef ribs. If your top pants button isn't undone by the end of this feast you aren’t doing it right. This award-winning restaurant and bar doesn’t hold back when it comes to flavour, serving up contemporary Japanese cuisine created by their innovative chefs. In the way of banquets Saké have three killer set menus for you to choose between. The lunchtime Bento Box feast is great for a midday meal and has everything you would expect in your classic bento like miso soup and edamame, as well as some goddamn delicious karaage. Then there's the chef’s New Classics banquet that takes diners through the culinary finesse of Sake's kitchen, from nori crisps to prawn tempura, and finishes with the chef's choice of dessert. The final banquet is the chef’s Onakase, a set menu newly created by the head chef each season and a seriously delicious feed. You may only be able to afford it a couple of times a year, but it is definitely worth every penny! If you are in the mood for pasta you cannot go past 1889 enoteca. Serving up modern Roman cuisine that definitely doesn’t forget where it came from, this traditional Italian restaurant will bring you a taste of one of the greatest culinary legacies the world has ever known. Their Sunday family table banquet is, as the name suggests, perfect for Sunday lunches with the kinfolk, with the choice of fresh gnocchi, ragu, or risotto and traditional Italian desserts and cheeses to finish. From antipasti to dolci, the only way you could get more authentic Italian in Brisbane is if your Nonna came to visit. Our tip, you have to try the tiramasu – you won’t regret it! Gauge is Brisbane fine dining at its best, serving up some of the most delectable (and instagramable) plates in Brissy. The menus take inspiration from the Australian and UK dining scenes, with the head chefs bringing plenty of experience and innovation to your table. Choose from set menus of two, three, or seven courses, with optional beverage pairings including wine and spirits from Australia’s most progressive producers. As for the meals themselves, think roast duck breast, kangaroo consommé, coal grilled lamb rump, and pumpkin ice cream, marrying flavours you would never expect that will blow your palate away. Madame Wu’s cool little sister Chu The Phat has followed in Wu’s footsteps, creating insanely good Asian street food with glorious style. Taking flavours from the hawker stalls of Hong Kong, Korea, and Taiwan, this multi-level, dual kitchen and bar behemoth of a restaurant is dressed to impress. Choose from their classic or express banquet, and expect kung pao chicken wings, steamed duck buns, and spring rolls abound. Top tip, this place is drool-worthy even for a quick lunch, and their cocktails make for epic after work drinks. Paying homage to the Southeast Asian palate is Pawpaw Café. When you think banquets in Brisbane, you think of Pawpaw. Their restaurant is iconic because of their beyond tasty range of Asian favourites, and of course their legendary green papaya salad. The Royal Banquet is only available for dinner and will make you feel like royalty, serving up plate after plate of roti, lamb curry puffs, nasi goreng, and Wagyu green curry. The Bangkok and Buddhist banquets are available for lunch and dinner, with staples such as pad Thai and an assortment of curries, the Bangkok being totally gluten free, and the Buddhist 100% vegan – score! Mons Ban Sabai is Brisbane’s most awarded Thai restaurant, holding the title of best Thai restaurant in Brisbane for three years running. Their master Thai chefs innovatively blend traditional and modern Thai cuisine to create the ultimate banquets. With all this hype you can bet the spread is nothing but top notch. They have two banquets, Chiang Mai and Phuket, inspired by the cities they are named after, and chock full of classic Thai favourites. Hot tip, the Phuket banquet ends with Mars bar ice cream… need I say more? So this one isn’t exactly your fixed price banquet, but the Fat Noodle has designed their menu to be mixed, matched, and assembled in banquet style to meet your tastes. This Asian-fusion restaurant encourages patrons to eat in the Chinese way, by ordering plates to share so you get a taste of as many delectable dishes as possible. Choose from a selection of small plates, dim sum, rice, noodle soups, wok dishes, and sides to create your bespoke banquet menu in this quality Brissy restaurant. Look out for when they do hold banquet specials, they are well worth the visit!